Georgia River Fishing • View topic - New Members, Introduce Yourselves!! the "Yak" kool-aid. I'm also making a little more time to get serious about fishing. Looking forward to meeting like minded river hounds. Welcome graydog...You are deffinetly in the right place..
Great bunch of helpful freindly folks around here. OK, I'm new! Well, maybe not that new. It's been a while since I've seen my 39th birthday! I've been yakfishing for 15 months now. I've been fishing most of my life and own an 18 foot center console. However, I think my center console is feeling sad! My yak is a Hobie Adventurer and I love it! I mostly hang out at jaxkayakfishing, but also stop at georgiakayakfishing. Hmmm....I tried to post the links, but I have to have 2 posts before I can do that. OK, this is number 2! I've yakfished more away from home than at home and I need to correct that situation. It's so easy to go to Jacksonville and find folks to show you around that I did a lot of that. if any of you come down for the Experience Coastal Georgia event, I may get to meet some of y'all. Perhaps we can fish some, too! New to yaks. Long story short; Couple of months ago, went down South River from Hwy 20 to Snapping Shoals in a 2-man plastic "bass-tracker" type boat with trolling motor (we were not fishing, just sightseeing). Wound up dragging more than riding. Kept thinking "wonder how wunna them kayaks would do on this run?" 2 weeks later, went to N. GA & rented yaks to try them out. Now I've got 4. Only 1 is really good for fishing though (OK Caper Angler). Grew up in middle GA. Mostly just did pond fishing and stuff with crickets, worms, chicken livers, etc. Never did much "fancy fishin'". At 46, want to learn all I can cause it looks like fun & it's an excuse to get the kayaks out. Thanks waderjon. Like I said, I don't know much about fancy species-specific fishing with artificial bait and stuff. Need to learn about it. I really like getting out on the water though and the paddling around is good exercise. Put in just below Snapping Shoals on the 15th with my son & some other folks & paddled down to Hwy 36. It was after the big rains & we got swept along pretty good. Didn't fish though. I've been looking through my new book "A Canoeing and Kayaking Guide to Georgia" for places to go. 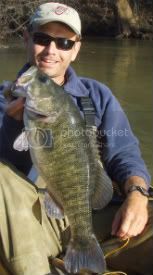 I think the fishing part will just add another element of enjoyment to the kayaking trips. Whereabouts are you at in McDonough? I'm in the Ola area. Welcome aboard Jeffk14. If you already know or want to learn to river fish, this is the place to be. More knowledge about put-ins, take-outs, tips, and techniques than you can shake a stick at (unless its an Ugly Stik). I'd like to introduce myself to the other members of GRF. My name is Jim Smith, I'm 57 years old and I live in Conyers Georgia. I've been fishing almost all my life, mainly warmwater for bass and bream. I usually fly fish, however I also spin fish when the fish go deep or are in heavy cover. I primarily fish in lakes with the exception of trips to the Hooch or the Georgia mountains for trout. I am fortunate enough to live on a lovely 50 acre lake that is loaded with bass and bream. My Hobie Outback kayak is my preferred fishing boat as it keeps my hands free for fishing and it is super quiet. The South River is about 100 yards behind my house and I have been tempted to wade it a bit to chase shoal bass with my fly rod. I'd love to learn more about river fishing and will be asking lots of questions on the boards. I am Georgia boy born and raised. I went to the UGA and got parolled in Janruary of 99. I immediately moved to Montana for 2 years and then from there to Colorado for the the last 8 years. I have become a very avid fly fisherman and get out every chance that i can. I travel as much as possible to catch many different types of quarry with the long rod. I enjoy the saltwater, warmwater for Carp, Bass, as well as Cold water resivors in Colorado for Pike. I mostly target trout at this time due to the close proximity of the blue ribbon fishery rivers near my house. i look forward to meeting and swaping lies and beers with some of you in the future. Welcome old man (biggerfloyd). Glad to see you finally joined us.